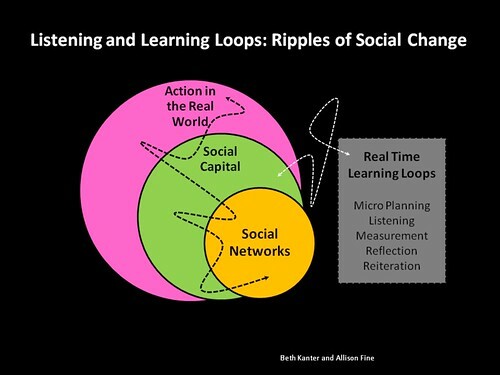 I was fortunate enough to be part of a webinar with Beth Kanter today. Beth gave a fantastic presentation and I really enjoyed our conversation (I'll post the link once it's available). that will be in her book coming out next year, The Networked NonProfit. What I love most about the way Beth thinks of measuring is that the impact, not the influence is the final goal. The big prize. All too many times, people stop at the influence part: how popular is that person? how many followers do we have? who is talking about me and my company? how much love do people feel for me? This is one of the biggest reasons I don't like to measure Whuffie. I get the question time and time again when I talk about the book. The question I *should* be getting is 'what can I do with my Whuffie?'. We should be less concerned about how many followers one has and more about what that person does with that many followers. Not only is Whuffie left better in the non-fungible, ephemeral realm, but it is inconsequential. The measure needs to be in the impact. If we concentrate on our influence, we forget the end goal. We get caught up in our ego. Remember the impact. What will be your legacy? That you were just famous for being famous (i.e. Paris Hilton and/or Vaporware)? Or that you made a difference, built something revolutionary, or led a real change in the world?